Customer Service is very important. How can I help you? I am happy to try and answer any of your questions. Here is a page of frequently asked questions. 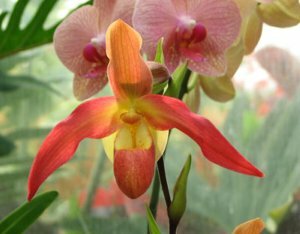 This page may have just the answer to the questions that you have about orchids. Check it out! Feel free to email me with any comments, (positive or negative), suggestions or topics you might like me to cover. If you have a specific question you can go to this link to contact us for support. Send me an email and I will try to answer your question. Or go to the Ask A Question page to see some of the questions others have ask. Maybe your answer is there. If you question is about Phalaenopsis Orchids then go here. If you have questions beyond these then contact me and I will try to answer. 1) Tell me the kind of orchid that it is if possible. Look at the plant and if there is a tag of any sort include that information EXACTLY as it is on the tag. Any information might be helpful. 2) If you don't have any idea what kind of orchid it is and if there is no tag or identification then consider sending me a digital picture of the orchid. Many people have access to a digital camera now and this can help me identify the orchid or at least the orchid family or alliance. And this will help me help you figure out how to grow it better or what it needs to flower. 3) Tell me the growing situation that you have for the orchid. Is it in the house? In a greenhouse? Or is it growing outside? Perhaps it is on a window sill? What kind of light does it have available? What kind of media is it planted in, Bark? Moss? Something else? How often do you water? Do you have good water quality? 3) Let me know the general area of the world that you live as the weather in specific places helps me understand the growing situation with respect to your plants (even if it is indoors). And please be patient! I get a lot of questions and I really try to respond and respond quickly but sometimes it just takes a while. Click Again here is the link to contact us for support and customer service.